Moscow (VNA) – The embassies of Vietnam and Laos co-organised friendship get-togethers, featuring musical performances and sports events, in Moscow, Russia and Geneva, Switzerland on August 5 to celebrate the 55th anniversary of their countries’ diplomatic ties (September 5, 1962). The events also marked the 40th year of the signing of Vietnam-Laos Treaty of Amity and Cooperation (July 18, 1977). 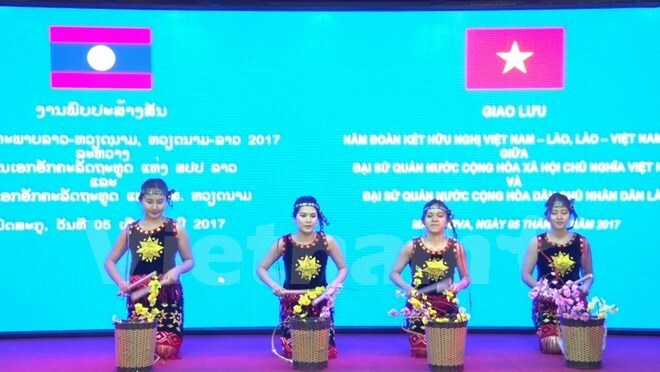 Performers from Vietnam and Laos took the stage with traditional tunes at the get-together at Hanoi-Moscow Complex (Incentra) in the capital of Russia where diplomats from the two embassies and their families gathered. The event also saw exciting table tennis friendly matches between staff at the embassies. In his remarks at the event, Vietnamese Ambassador to Russia Nguyen Thanh Son highlighted the long-standing relations between the two nations and how their peoples sacrificed for each other and stuck together through thick and thin during struggles for liberation. His Lao counterpart Siviengphet Phetvorasack said the 40-year Vietnam-Laos Treaty of Amity and Cooperation has laid a great foundation for enhancing the two countries’ solidarity and building their bilateral relations and comprehensive cooperation. The ties, hereby, have been deepened and made day-by-day progress, he noted. The Lao ambassador expressed his thanks to support of the Vietnamese government and people for Laos in fights against imperialism and in national development. He believed that the growing ties would bring prosperity to their people.